Electricity comes alive in The Night Journey, a mesmerizing light and sound installation by London-based multimedia artist Haroon Mirza. This site-specific, immersive artwork arises from the artist's interests in Sufi mysticism, meditation, trance music and other consciousness-altering practices as alternate ways to experience the world. The Night Journey is based on an Indian miniature painting in the Asian Art Museum collection. Mirza has converted a pixelated version of this image into a score, or source code, for his custom-built media system. 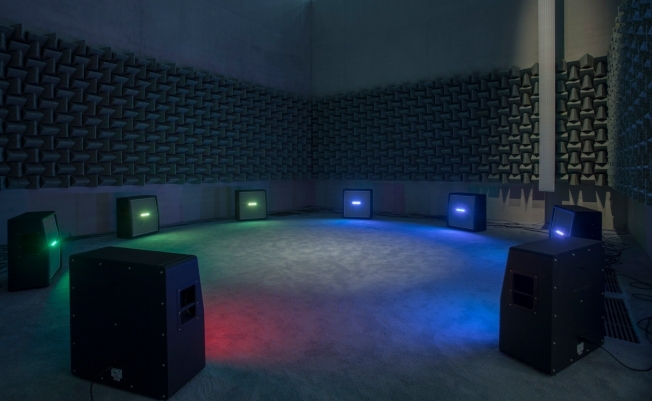 Visitors enter a darkened room, where they are surrounded by vintage speakers that "play" the score as electrical sounds - corresponding with colored LED lights.